This is an education initiative brought to you by the PSS ILTC Workgroup. There are 3 activities in this module. You have 1 attempt for the Pre Test. Please note that a passing score is not required to continue with the activities of this module. Note: There is no save function for incomplete test attempt. However, it will not be considered an attempt if the test has not been submitted. 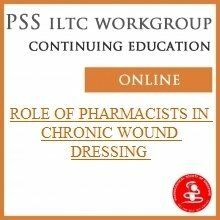 Activity 2 Role of Pharmacist in Chronic Wound Dressing Please complete this activity by viewing the slide deck. Activity 3 Post Test You have 2 attempts for the Post Test. The explanation to the answers will only be displayed if the passing score is achieved. You will not be able to generate the Certificate of Completion if you do not obtain a passing score upon your second attempt. You will have to re-purchase the module in order to try again. The passing score is 80%. Note: There is no save function for incomplete test attempt. However, it will not be considered an attempt if the test has not been submitted. After the Module Validity Date, activities can still be viewed. Pre and Post Tests will no longer be available and CPE points cannot be obtained after this date. There will NOT be auto-submission of CPE points to Singapore Pharmacy Council. Please file your CPE points via the Singapore Pharmacy Council Portal. Refund Policy: Online products cannot be refunded.